The morning after Old Trafford's Twenty20 washout, conditions were fit enough for Lancashire and Sussex to start their Championship match on the same pitch that was due to host England and Australia. The umpires, Neil Mallender and David Millns, were happy with conditions when they inspected at 9.15am, although they told both captains they would take into account if any bowlers had problems with the run-ups. However, when play began 15 minutes late at 10.45 there seemed few issues as Robin Martin-Jenkins sent down the second over of the day from the Brian Statham End. Jim Cumbes, the Lancashire chief executive, said after the abandonment he believed a county game would have taken place. "We've played Twenty20 domestic matches in far worse conditions than that." There was a significant amount of sawdust on the offending area, a two-metre square block behind the stumps that was deemed too dangerous for last night's match but Martin-Jenkins was confident in his delivery stride. "There were other areas [that were wet] as well," said England captain Paul Collingwood the previous evening. "The backward point area was very wet as well. But specifically it was that one area in the bowlers' run-ups which is a crucial part of a cricket pitch. "With the run-ups for the bowlers and the weight that goes through that part of the ground - especially in those take-off areas - the risk was too great. I spoke to Michael [Clarke] and both of us said if you're asking your boys to run in 100% then it is going to be pretty dangerous. That's why the umpires made that decision." Both captains defended their decision not to try and get a game of some description for the full house, amid accusations that they were being 'soft', by saying that it would have made a mockery of an international match. "Of course it would," Collingwood said. "To mark out wide run-ups just to miss and area and stuff like that, it becomes ridiculous. Obviously the umpires made a good decision." "There are a couple of things there you can do to put on a show for the crowd but the fact is it is an international Twenty20," Clarke said. "You want to play your full-strength team. There's no game I play for Australia where you go out and bowl some full tosses so the crowd get a great spectacle. However, Nathan Bracken, the Australian left-armer, said the team were readying themselves to play before the umpires ruled conditions unfit. "I understand a lot of people were there and missed out on a game but we missed out on playing a game as well," he said. "We were prepared...guys had strapping tape on ankles, guys were walking around the changing rooms with boots on ready to go. "We were right to go and the umpires made the decision that they saw fit. If you start questioning things like that you're starting to get into really shaky ground, They made the decision that was right. We support the decision they made. It's the same as if you nick one behind and you're given out or not out, you accept the decision and move on." The ECB have launched an investigation and Chris Wood, the pitches consultant, examined the offending area during the lunch interval of the Championship match along with Cumbes and groundsman Matthew Merchant. 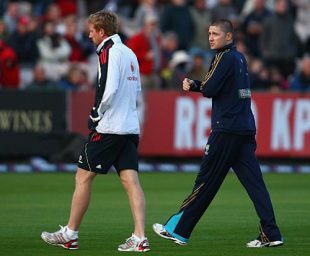 Wood will file a report along with the assessments from the match referee, umpires and ECB's venue manager. Earlier this season Yorkshire were heavily criticised when the one-day international against West Indies was abandoned after the new drainage couldn't cope with a torrential downpour, and Edgbaston also suffered when the third day of the Ashes Test was washed out. So much for a barbecue summer.